One of the battalion of Beeboids covering the US these days, Jonny Dymond, has just done an extremely one-sided collection of sob stories for Today about the struggles of the middle class. He went to a couple of slowly dying cities in Connecticut to create his tapestry of woe, and his agenda is clear. I say it’s one-sided not because there are tons of stories of rising successes for the middle class he could have provided in the interests of balance, but because of the way Dymond presents the situation in the first place. Highly selective, and framed in a very narrow-minded fashion. The whole story is presented as a case study in how the 2008 financial disaster and the subsequent recession has ravaged the middle class, the backbone of the US. But the agenda here is really to support the Occupiers’ cause. Dymond starts out in a metal parts factory in Prospect, CT, where he wrings his hands over the plight of the workers. They no longer get the guaranteed annual raises, or the constant overtime which pads the regular paychecks of anyone on an hourly wage in any industry (especially including the public sector), so their American Dream, he opines, is on hold at best, and possibly even disappearing for good. The factory boss also laments the plight of his employees. But in the middle of all this, he casually mentions that Connecticut hasn’t actually has any net job increase in 20 years. What does that have to do with 2008 or the recession? He and one of his suffering employees also point out that the food prices and gas prices and taxes are going up and up, which makes things tough for those on an essentially fixed income. Well, we can all guess what the standard BBC answer to that is: they need pay rises. Never mind that Connecticut ranks 47th in crushing taxes which hurt businesses and job growth. The Tea Party movement – so disparaged by the BBC – wants to lower taxes, something that’s an anathema to Left-wingers like Dymond, so he doesn’t mention the idea. Nor does he mention that the Democrats who run the state recently enacted the largest tax increase in state history. (Over the last two decades, when the state wasn’t run by Democrats, it was run by Bush-style Big Government Republicans, the kind the Tea Party movement has been working to get rid of.) Dymond also better hope that none of these factory workers earn more than $50K pa, or have spouses earning a similar middle-class income, as the Democrats who run Connecticut recently raised state income taxes for both. These aren’t even the “millionaires and billionaires” against whom the President often rails, either. Food prices going up? Even the Guardian admits that this is in large part due to the Warmists forcing biofuel down our throats, causing edible corn prices to skyrocket, which drives up everything else. Who’s robbing the American dream here, Jonny? One of those responsible is the Democrat former Senator, Chris Dodd, who was partially responsible for driving the mortgage crisis, and got a sweetheart deal from one of the failed sub-prime companies. Never mind all the campaign largesse he got from the industry. One of the staples of the American Dream Dymond mentions is home ownership. Well, he better hope none of his struggling middle class workers in Connecticut own homes these days, as the Democrats who run the state have made property taxes there 50% higher than the national average. Sure, these geniuses think they’re doing to it soak the evil rich bankers and David Letterman who live within commuting distance of New York City, but the unintended consequence – as always in these cases – is that hurts the middle class most. Dymond couldn’t be bothered to find this out, as it would detract from his Narrative. If that’s not bad enough, they also just raised the state sales tax from 6% to 6.35% (still significantly lower than New York, but then New Jersey has no sales tax on retail good at all), and eliminated tax exemptions for all kinds of things which affect these middle class factory workers, like heating oil and the sacred property tax credit. They even killed the tax exemption for products which help people quite smoking. At the same time, they jacked up taxes on cigarettes. I hope none of those struggling factory workers smoke, or if they do they’re not thinking of quitting any time soon. So much for the American Dream, eh, Jonny? As we all know, and which the BBC has mostly kept from you, some states not controlled by Democrats have cut taxes and added jobs. Even New York, with the highest tax burden in the country, the Democrat Governor is trying to fix the budget without raising taxes. But that doesn’t help the Agenda, now, does it? So don’t bring it up. To tie it all together, Dymond goes to the city of Hartford to meet up with his darling Occupiers. He manages to find one of them who hasn’t pulled a knife on someone. This Occupier laments that we’ve all been lied to, that there’s no such thing as the American Dream. What Dymond fails to realize is that this, just like the factory bosses’ statement about no net job growth for the last 20 years, also has nothing to do with the recent financial crisis and recession. This Occupier means that there has never been an American Dream available to everyone willing to work for it. He’s not talking about a temporary rough time we need to fix at all. This keeps happening with BBC reports on this issue. On the one hand they say that the Occupy movement is inspired by anger at the greedy bankers who caused the financial crisis that everyone else has to pay for. Ask yourself how many times you’ve heard someone (usually a trade union mouthpiece or Labour politician or Robert Peston) say that people are being forced to pay for a crisis they didn’t cause. On the other hand, they moan about income inequality and corporate greed. But if this is all anger at a recent phenomenon, why do the Occupiers keep saying that this has always been a problem, and everything has always been bad? It’s because the BBC keeps misleading you about the whole story, as Dymond is doing here. This is a very biased report. Everything is framed from one side of the issue, and facts which detract from the Narrative are swept under the rug. Anyone catch the inquisition of BP’s Tony Hayward on Today this morning? Of course we realise that the Oil Spill in the Gulf of Mexico is a serious matter, not least for the loss of life of those workers (rarely mentioned by the BBC) but this was a clear assault on BP, with the repeated use of aggressive phrases emanating from the Obama regime. I thought Hayward handled it well but once again the BBC’s hatred of successful business comes across, dressed in faux concern for the environment. BBC asks "Why so sensitive on immigration?" As the election approaches, immigration has become a primary concern for many voters but the sensitivity around it is preventing election candidates from making immigration a central issue. Could that sensitivity and reluctance perhaps have anything to do with the way the BBC has dealt with the issue in the past? 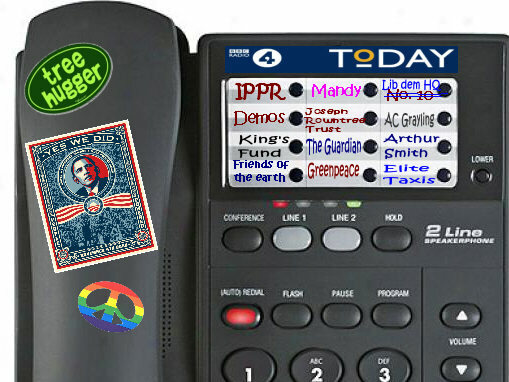 When immigration – or more specifically Tory immigration policy – became a major topic during the 2005 election campaign, the Today programme responded by doing an outside broadcast (on St George’s Day) from Leicester. The leader of the Conservatives on Leicester City Council was invited on to defend his party’s policies; he faced a hostile audience and a clearly biased Carolyn Quinn who sided with the crowd and lobbed easy leading questions to a pro-immigration community representative. It’s a bit rich of the BBC to suddenly start asking why politicians from the mainstream parties are reluctant to talk about immigration when the BBC itself has shown such antagonism towards those who have raised the issue in the past. I’ve been very busy in recent days with little time to blog. Luckily, I have also managed to avoid most BBC news – but then this morning I tuned into that daily fest of institutional bias that is the Today programme. What joy! For starters, we had a concerted attack on the Conservatives at 7.34am. Cameron has said that all MPs and peers would have to pay taxes in the UK under legislation that would be rushed through if he became prime minister. Ah -but what about BBC bete noire Lord Ashcroft? I felt a bit sorry for Phil Hammond – he got more abuse from the BBC interviewer than from Lib-Dem Chris Huhne. The BBC seems to obsess about Lord Ashcroft and nothing Hammond said was good enough. Of course we all know that Labour and the Lib-Dem’s are squeaky clean on the issue of tax, right? This item segued effortlessly into a character assassination on the new AGW realist leader of the Australian Liberal Party, Tony Abbott. The Aussie opposition has committed the cardinal sin of removing Malcolm Turnbull from his leadership position for his inept indulgence of Rudd’s pro-AGW fantasies and therefore the BBC has no sympathy whatsoever for this Party or it’s leader! Poor Abbott, it’s only Diane the BBC likes. I also see that the Today will be guest edited by Communist-loving Robert Wyatt over the Christmas period. Here’s Robert sharing his wisdom on the subject..
You can see why the BBC like him, can’t you? Listening to the Today programme is akin to enduring one sustained leftist whinge – no wonder I try to avoid it. I never hear news, all I listen to is sustained propaganda. I couldn’t bring myself to listen to Hillary Benn as he hypes up the acid oceans drivel, nor indeed did I pay much attention to Ed Miliband’s PR announcement that we are running out of time to save the world at Copenhagen. I also see that the BBC have found a new hero in the shape of Sir Ken McDonald, the Torquemada of Matrix, who gets stuck into George W Bush and Tony Blair for their “foreign policy disgrace. Am going to be away from the site most of today but aim to be back for Question Time live tonight so please come along for our weekly entertainment! On daily matters, Today was in fine form today. Did you catch the item about Trade Unions putting forward candidates for election because the current government is morally bankrupt Obviously the Public Sector trade unions are paragons of virtue! Then we endured Sir Richard Dalton – formerly our man in Iran – was on to ease concerns that Iran’s latest missile launch is just the Mullah’s seeking a way to find peace. Nothing to worry about, move along. Proof that Obama’s outreach programme is working. Finally, the BBC had an item at 7.20am to make clear that whilst some of us may be a tad cross at the greed shown by our politicians, in actual fact we are all just as likely to engage in such cheating behaviour. And we have to fund this crap….? Seems to me that the BBC has moved into full “Save Labour” mode as wave after wave crashes down on the hapless heads of their paymasters and political soul-mates in government. The Today programme this morning is a classic example. The lead story, just after 7am was the scandalous abuse of the expenses systems by cabinet members, including the Dear Leader and that £6000 cleaning bill. As you know, the Telegraph has revealed all the sordid details, including Ms Blear’s scams, Jack Straw’s “errors” – the whole rotten lot. What to do? Cue Nick Robinson who pops up to say that none of this is too bad and when you compare it to what happens elsewhere it is no big deal. Cheers Nick – glad you take this relaxed view of OUR taxes being abused by the scum in power. Next up, the Government controlled RBS announces first quarter losses of £44m. That’s a loss to you and me, the tax-payer – who bankrolls this failed bank. Up pops Robert Peston to suggest that this result is not that bad and that there are plenty of good things in the RBS announcements. How wise government was to step in and bail it out, right? Never mind – if you are feeling about down about the BBC tune in to Thought for The Day, it has Abdal Hakim Murad, Muslim Chaplain at the University of Cambridge on to share his wisdom with us all. Allah be praised. It’s an alternative universe these people live in and I only hope that when the electorate throw Labour out of power, the incoming Conservative administration finally faces up to the menace that masquerades as a State Broadcaster. If it doesn’t, it will regret it.